My mind is centered on the BEACH! I leave tomorrow.. and getting ready to go on vacation is as time consuming as preparing for a substitute! Seriously, my to do list is loooong! The stuff gathering to be packed is getting ridiculous. My sister sent me this little comic strip years ago. It hangs on the bulletin board in my office. And, it is so true. We definitely either need a flatbed trailer or a cargo plane to get there! I was up this morning at 7 am baking cookies to take with us. I unwrapped 36 Reese’s peanut butter cups and didn’t eat a single one. That in itself is a miracle. I ♥ peanut butter! I have my stack of books and my kindle charged up ready to go! Sleep, eat, read.. those are the three most important things for this week! I look forward to it each year. 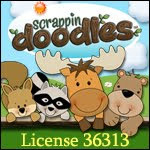 My Doodle Bugs Paper website got a little makeover this week! I am just tickled to death with the results! Hop on over and take a peek! I wanted to update you on the Oklahoma fundraiser that a group of us did last week. I cannot take any credit for any of the hard work that went into this successful fundraiser. Ashley was the workhorse behind the whole thing. I was just one of the 25 teachers who donated a product for the fundraiser. We were thrilled when Ashley made the announcement that our final total was $29,394.00.. and 100% of the profit went directly to the American Red Cross to help the Moore Oklahoma tornado victims. Thank you to anyone who donated and helped us raise money. Share your Five things from today or this week and link up below! Have fun on your Beach vacay! I love being able to read all I want on summer vacation. I am jealous you get to go to the beach! A beach sounds AMAZING right now. :) I've read all of those books. They're wonderful books. Karen Kingsbury is an awesome author! :) I am your newest follower! I'd love for you to head over to my blog and follow me as well! Have fun at the beach! Those cookies look so delicious! Have a great vacation! I so wish I was leaving for the beach!! Jealous! Those cookies are one of my favorites, but I don't make them very often because I hate unwrapping the cups! I'm linking up with you today and if anyone is reading I would love for them to stop by my blog and give some input/advice for a special ed. teacher planner I am working on! Enjoy the beach! Those cookies look delicious, and there's nothing better than reading a good book while relaxing in the sand! I hear ya on packing for the beach! We don't leave until the end of June, but I've already started making lists. It's easier than waiting until the last minute. Which beach do you go to? Jealous of your beach vacation! (and those cookies) Enjoy! HUGE applause for not eating those pb cups. I. would. fail. that. test. :) Have a great trip! Thank you for doing these linky parties. They are awesome! Those Reese's cookies are my absolute favorite!!!!! I'm impressed you didn't eat any while making them...I have no control when it comes to peanut butter :) Enjoy the beach!! Those cookies look amazing! They are the perfect treat for your trip. Have fun!! Love the comic that is exactly how I feel whenever we go anywhere with kids! Enjoy your time to "eat, sleep, and read". Here in Chicago we still have a few weeks to go until summer break! Thanks for hosting! I am trying to branch out more, so this is my first Five for Friday! I hope you can hop on over and join my blog too! Have a great beach vacation!! $29,000 is an amazing amount that was collected! Way to go!! I love that comic strip! My family is going on a vacation in July and my head is already spinning thinking about all the stuff we need to pack. Enjoy your trip! What a great fund raiser...What a blessing that will be to those in need. One more week and I'll have my toes in the sand, too! I love your new blog design for your business page! Thanks for hosting every week! Yummers- peanut butter cup cookies... are they all gone now? Have a wonderful beach vacation! I love Karen Kingsbury books!! And how did you stop from eating the PB?? It's a weakness!! I shared pictures of my class's frogs from your Spring Directed Drawing activities if you'd like to check them out. I make the cookie/Reese's treat a lot, but I can never manage to not eat several as I'm opening them! Hi! I am gearing up for my beach trip this week! I don't think I would've been able to not eat one of those Reese's cups though! Love your blog and I am your newest follower! If you have a moment, stop by my blog...I am brand new! Can't wait to see more posts!